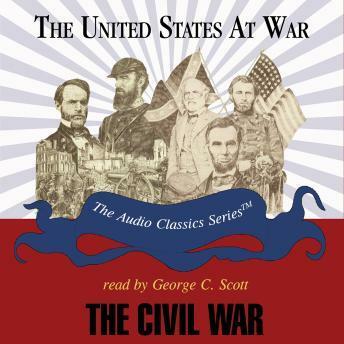 This volume is a two-part history of the Civil War. From 1861 to 1865 America was caught in the convulsions of war-the Civil War. No historical event, short of the American Revolution itself, has so deeply affected the United States. The Civil War is often called the War between the States by Southern historians, aptly illustrating the political question underpinning the war: Was the United States one nation, or were the United States a group of sovereign entities that could choose to disassociate? Both sides honored the same constitution, spoke the same language, and worshipped the same God. But the two could not agree on whether America was a union or a compact of states. With the advent of war, the Confederate States of America faced serious problems. The Confederate population was 9.1 million compared to the Union's 19.1 million. The South controlled only one quarter of America's wealth. Its railroad mileage was only half that of the Union, and its navy was badly outnumbered. But the South was fighting a defensive war on its own soil, and military theorists agree that such a war requires a three-to-one superiority for an aggressor to win. Many believed the South could prevail. Nevertheless, on April 9, 1865, General Lee surrendered what remained of his army. But what had the North won? The United States of America was now one nation under God. But that nation was crippled by the economic costs of the war-wholesale destruction, inflation, poverty. The political costs were no less. Abraham Lincoln had been assassinated; Southern leaders were in jail; the federal government had swollen in size and power. Northern politicians then began to "reconstruct" the South, building state governments that would be loyal to the union. But the conquered South simmered with resentments that could not be legislated out of existence.